SOAP is a wonderful technology that can help you in developing great applications. In this tutorial, we will investigate the use of SOAP in PHP. irrelevant to your skill set. It’s time to wake up and realize they’re here to stay… and for good reason! and enable your application to scale as your needs and user base increases. If you believe like I do that the Internet is the ultimate building ground of our future, then you have to see that the ‘hackish’ method in which most applications for the web are built and designed is pitiful. I know that I am quite guilty of it, myself. Many times I get an itch and I just scratch it without thinking of what the future holds or the maintainability of my application. Sure the job gets done; the itch has gone away momentarily. But when the itch comes back six months down the road and I have to add or modify features, I am utterly disappointed in myself over the sorry shape of my code. You may be asking, how can XML and SOAP help me to avoid poor application design? Well, by themselves they won’t help at all. First and foremost you must get yourself into the mind set that it needs to take place. XML and SOAP are just two tools that will allow you to accomplish your goal. Today we will build a Web Service using SOAP. In doing so, I hope that you will become familiar with the technology so that you can start incorporating it into your future applications. datatypes, and a convention for representing remote procedure calls and responses.” (http://www.w3.org/TR/2000/NOTE-SOAP-20000508/)%br%%br%SOAP is what you are here for. We will develop both a client and a server for our SOAP service. In this tutorial, we will be using the NuSOAP library. “WSDL is an XML format for describing network services as a set of endpoints operating on messages containing either document-oriented or procedure-oriented information.” (http://www.w3.org/TR/wsdl)%br%%br%As with XML, we will not be directly any WSDL documents. The wonderful NuSOAP library will generate WSDL documents for us. What you need to know about WSDL is that it is a document that describes a Web Service. It can tell a client how to interact with the Web Service and what interfaces that Web Service provides. We will define a Client as a script that uses a Web Service. Conversely, a Server will be defined as a script that provides a Web Service. Today we are going to build a Web Service that will return a stock price given a particular stock symbol. This is a classic example of where Web Services are of great use. You may be building an application that needs the data and could very easily just pull the data directly from your data source. Building a Web Service for it, however, allows you to give other applications easy access the same data in the future. It also separates the data extraction from the data source from the application itself. Say you were storing the data in a MySQL database but later decided to move it to a SQLite database… in this scenario your application wouldn’t know the difference. Its calls to the Web Service remain unchanged. To provide a stock quote service you will have to have the stock prices and symbols stored in some fashion or another. This tutorial is not going to concentrate on the storage mechanism or how to obtain the prices. I will simply provide you will a table schema and some sample data to work with. VALUES ( 1, 'ABC', '75.00' ) ;# 1 row(s) affected. VALUES ( 2, 'DEF', '45.00' ) ;# 1 row(s) affected. VALUES ( 3, 'GHI', '12.00' ) ;# 1 row(s) affected. VALUES ( 4, 'JKL', '34.00' ) ;# 1 row(s) affected. The first thing we need to do is to create the SOAP server. This is the script that will fetch the data from the database and then deliver it to the Client. One wonderful thing about the NuSOAP library is that this same Server script will also create a WSDL document for us. The first step is to create a function that will fetch the data we want. Create this function just as you would any other. It is just straight up PHP. The one trick is to name the function something sensible, as this will be the name that is used when the Client contacts the Server. $query = "SELECT stock_price FROM stockprices "
Now, it is time to turn this function into a Web Service. Basically, all we have to do is include the NuSOAP library, instantiate the soap_server class and then register the function with the server. Let’s go through it step by step, after which I will present the completed script. The first thing necessary is to simply include the NuSOAP library. Next, instantiate an instance of the soap_server class. The next line is used to tell NuSOAP information for the WSDL document it is going to create for us. Specifically we specify the name of the server and the namespace, in that order. Now, we register the function we created with the SOAP server. We pass several different parameters to the register method. The first is the name of the function we are registering. The next parameter specifies the input parameters to the function we are registering. Notice that it is an array. The keys of the array represent the names of the input parameters, while the value specifies the type of the input parameter. One thing that pure PHP programmers might find odd is that I had to specify what types my input and return parameters are with the designations of xsd:string and xsd:decimal. It is required that you describe your data properly. You are not dealing with a loosely typed language here. The third parameter to the register method specifies the return type of the registered function. As shown below, it is fashioned in the same way as the last parameter, as an array. The next two parameters specify the namespace we are operating in, and the SOAPAction. Now, we finally finish it off with two more lines of code. The first simply checks if $HTTP_RAW_POST_DATA is initialized. If it is not, it initializes it with an empty string. The next line actually calls the service. The web request is passed to the service from the $HTTP_RAW_POST_DATA variable and all the magic behind the scenes takes place. At this point you have a fully functioning SOAP Server. Clients can connect to it and request data. If you haven’t done so already, bring up the script in your browser and see what you get. You should get a page giving you a link to the WSDL document for the Server. Click on it and you should see the resulting WSDL document. Surprise, surprise, it is in XML! If you read over this document, you will see that it describes what happens for a request and as a response for your particular SOAP Service. Note that while it is possible to create a SOAP Server without having it create the WSDL file, I recommend creating the WSDL document anyway. It is simple enough, so why not? Creating a SOAP Client to access our Server with is just as simple as creating the Server was. Understand though that the Client does not necessarily need to be a PHP Client. The SOAP Server we just created can be connected to by any type of Client, whether that be Java, C#, C++, etc. To create the SOAP Client, all we need to do are three things. First, include the NuSOAP library. This is done just as it was for the Server. Secondly, we need to instantiate the soapclient class. We pass in the URL of the SOAP Server we are dealing with. Last make a call to the Web Service. The one caveat is that the parameters to the Web Service must be encapsulated in an array in which the keys are the names defined for the service. You will see that I have an array key named ‘symbol’ because that is the name of the input parameter of my function. If you remember how we specified the input parameters when we registered the function with the server, you will see that this is very similar. 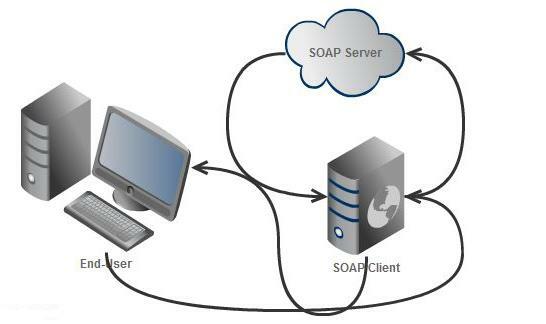 Hopefully after reading through this tutorial you have an understanding of how simple it is to create a SOAP Server and Client with NuSOAP. It simply astonished me how utterly simple it was after I actually took a look at it! Before I ever laid eyes on it I had dreams of a complex system that would take months to utilize. Luckily, NuSOAP came along and made that task simpler than anyone could ever ask for. As you can see, SOAP is a wonderful tool for separating your application into smaller more manageable pieces. Do realize that SOAP isn’t the cure all for everything. Its overuse is just as bad as any other poor design. The key to a good application design is patience and planning. Sit down, take out the old pencil and paper and write things down. Understand what you are really getting yourself into and ask lots of ‘What If’ questions. Think about the future of the application and ask yourself about the different ways it may be used in the future. The number one pitfall of application design is painting yourself into a corner. If you just thought about it ahead of time you could have started at the other side of the room. Here, the class for client calling from server is nusoap_client, not soapclient. For soapclient this code will not work. I have created this code to insert data into my database using nusoap. Everything is working fine but the data are not inserted at my database. Anyone has any idea why is this happening? Thank you in advance. Hi I used ur code it worked nicely.